The following are some suggested omissions from the Irish Left Archives twentieth century timeline of the Irish Left. The groups below appear to be consistent with those included in the timeline and are in no particular order here. Irish Citizens Army: Roddy Connolly had wanted to form a Workers Defence Corps in 1929 (the organisation was proscribed in 1931) and Republican Congress temporarily reinvigorated the Irish Citizens Army, with Connolly, his sister Nora Connolly O’Brien and Mick Price all active. The Connolly’s ended up in two competing factions in 1935, with Price on Nora’s side. By 1936 the Irish Citizens Army had faded away (see Hanley, The IRA 1926-36). Laochra Uladh: A republican group led by a former member of the IRA’s Northern Command staff, Brendan O’Boyle, active from 1949 to 1955 (see here for more). The group never issued a political programme and O’Boyle also tried to become Chief of Staff of the IRA. Laochra Uladh appears to have largely been a project to pressurise the IRA into mounting operations in the north. O’Boyle may have saw creating a pipeline of weapons and funds as a route to gaining the Chief of Staff post, to simply a kickstart a campaign, or both. O’Boyle was killed on an operation in 1955 marking the end of Laochra Uladh. Anti-Imperialist League: Active in the early 1930s, included the likes of Maud Gonne, Madame Despard and leading IRA figures. Organised public protests against imperialist events and symbols (see MacEoin, The IRA in the Twilight Years, 1923-48). Despard was involved in various other organisations promoting social justice, feminism and other left agendas, including the Irish Women’s Franchise League, the Women’s Prisoners Defence League and Saor Éire. 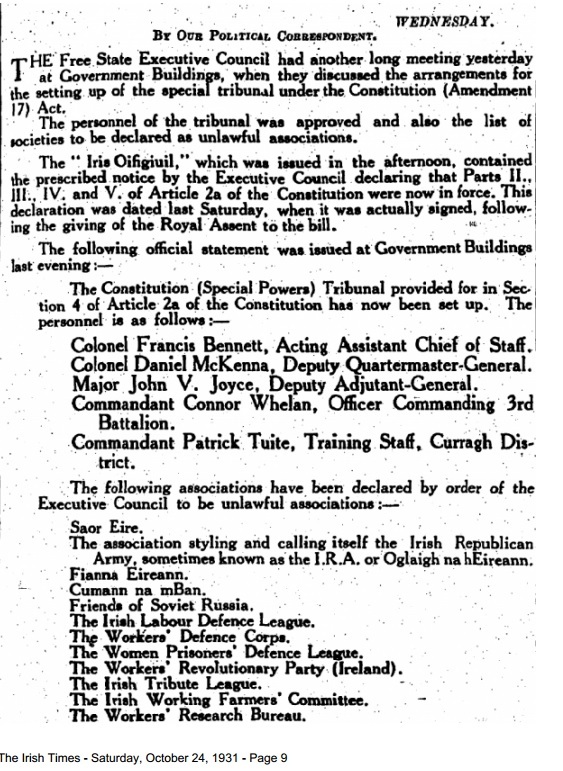 The latter two were on a lengthy list (see below) of left and republican organisations banned by the Free State government in October 1931, that also included the IRA, Cumann na mBán, the Fianna, the Irish Labour Defence League, the Worker’s Revolutionary Party, Irish Working Farmers’ Committee, Worker’s Defence Corps, Workers Research Bureau, Irish Tribute League and The Friends of Soviet Russia. 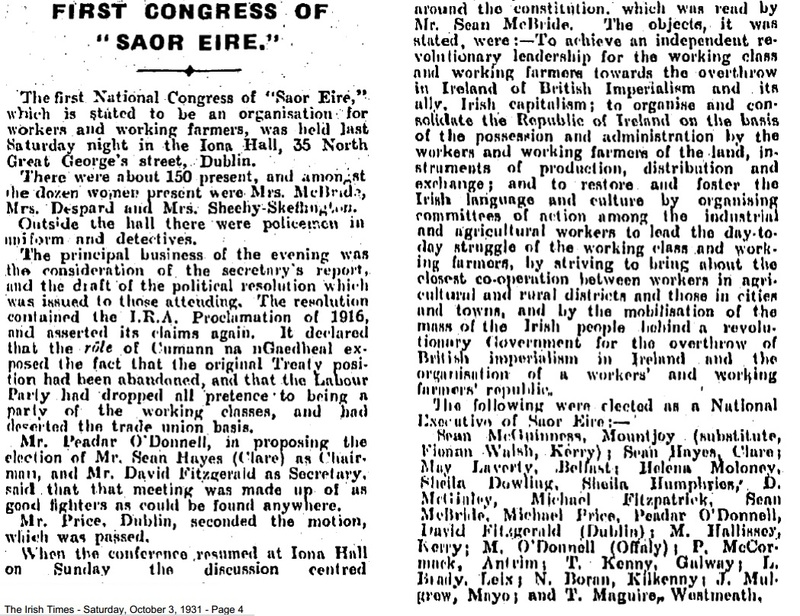 Saor Éire had held its first congress in October 1931 (see below), with no sense of irony Fianna Fáil was to immediately claim it was the real target of the bans. Official notice of proscription of various republican and left organisations by Free State government in October 1931. First Saor Éire congress, October 1931. Irish Republican Brotherhood: This is the name of a group formed in Dublin in 1950-51 and disbanded by Cathal Goulding (see Bowyer Bell, The Secret Army). Saor Uladh: Liam Kelly’s organisation Fianna Uladh, founded in Tyrone in March 1952 and it’s military grouping, Saor Uladh, active from 1954. Kelly had been expelled from the IRA for mounting unofficial operations. He was elected to Stormont and was appointed to a Seanad seat at the behest of Sean McBride, flagging support for Fianna Uladh/Saor Uladh from Clann na Poblachta (and hinting at a previous McBride project, Saor Éire). Joe Christle’s group that broke from the Dublin IRA in 1955 also aligned itself with Saor Uladh. Gerry Lawless had founded a group calling itself the Irish National Brotherhood and Irish Volunteers, been absorbed into the IRA and then broke alongside Christle. The Christle-Lawless group began mounting operations on the border to try and force the IRA and Saor Uladh into action. In the end, a composite Saor Uladh-Christle-Lawless group mounted attacks along the border. In the north, relations between imprisoned and interned members of these groups and the IRA remained largely amicable. In the Curragh, they were tense. Echoes of these difference were to continue throughout the 1960s (see Bowyer Bell, The Secret Army). Wolfe Tone Societies: The bicentenary of Wolfe Tones birth saw the founding of the Wolfe Tone Societies to try and find support among parts of the working class community, including those in the north that traditionally voted for unionist candidates. It was initiated from within the republican movement late in 1962. According to Roy Johnston, it seems to have been more likely from the IRA than Sinn Féin, although those involved at an early stage, like Uinsean Mac Eoin, Harry White, Lorcan Leonard and Richard Roche don’t appear to have still been active within the IRA. Known as the Wolfe Tone Bi-Centenary Directories, it was a political project supported by the IRA and Sinn Féin becoming the Wolfe Tone Society in 1964 with a role in the emerging Civil Rights movement (see Johnston, Century of Endeavour). The idea of the Wolfe Tone Society displacing Sinn Féin as the political ally of the IRA was being mooted by 1966 (see Swan, Official Irish Republicanism, 1962-72). Instead the Republican Clubs were formed in 1967, while they are seen as the predecessor of the Workers Party, their history appears more complex as the chair of the Belfast Directorate of Republican Clubs was Jimmy Steele, who was prominent on the Provisional Army Council side of the IRA split in 1969-70.